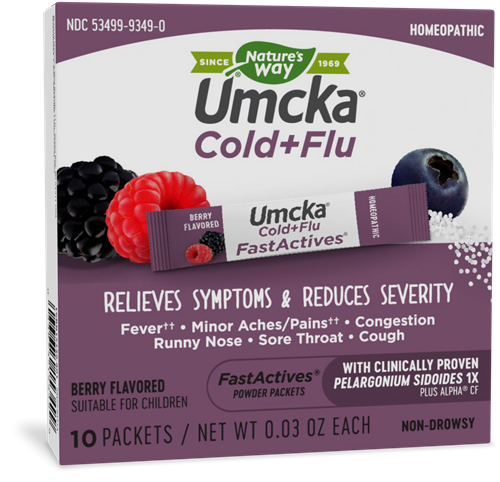 Umcka® FastActives® Berry Cold+Flu / 10 pkts/box - Nature's Way®. Homeopathic - Powder packets to shorten the duration of cold & flu. Sometimes you’re not sure if it’s a cold or flu. Why Umcka Cold+Flu Berry FastActives®? Suitable for Children – Convenient and Non-Drowsy! Umcka Cold+Flu Berry FastActives combine Pelargonium sidoides 1X plus Alpha® CF into one great-tasting, non-drowsy, multi-action cold and flu formula. The convenient delivery form allows you to pour great-tasting powder directly into your mouth. The powder packets are easy to pack and carry with you, so you can take them at a moment’s notice. Plus, they’re delicious and safe for ages 6 and up. Adults & children 12 years of age and older: Take contents of 1 packet 3 times daily. Children 6-11 years of age: Take contents of 1 packet 2 times daily.